Playing With Fire - Staging "The Ring"
“When Art Meets Politics.” This was the essence of Dr. Peter Bassett’s text in a thoroughly entertaining and salutary talk to the Richard Wagner Society of South Australia on 18 June, entitled ‘Playing with Fire – the pursuit of a Wagner performance tradition in Adelaide 1995 – 2005’. 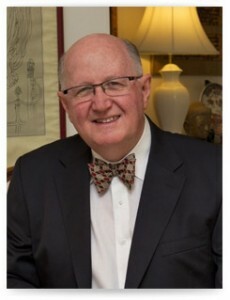 President Geoffrey Siedel introduced Dr Bassett, who was uniquely placed to cover this topic, having completed a PhD on it, as well as being closely involved with the productions that comprised Adelaide’s Wagner Decade (he was Artistic Administrator and Dramaturg for the 2004 Ring). The Society had the benefit of a full and incisive analysis of the decade, from the announcement by Premier Brown and Arts Minister Laidlaw in 1995 of a 1998 Ring, the first staged in Australia since 1913, and the tantalising prospects of a reprise of the successful 2004 production. The Adelaide Rings were among the most significant arts events in SA history. Only the biggest opera companies in the world can realistically mount a Ring Cycle. Bassett quoted Barry Millington to the effect that it poses “a test of virility.” To mount it elsewhere, you need plenty of help. Critical to success of Adelaide 1998 was the huge local involvement and support – at government, institutional and corporate level and from among the citizenry. Also, the infrastructure was already in place, in the form of the Châtelat production. The right people occupied key positions, for example, Bill Gillespie as Artistic Director, with Stephen Phillips on production under the auspices of Donald McDonald at State Opera. These folks had strong connections, especially on the East coast, and the Ring got enthusiastic support from there (the novelty of Adelaide as Australia’s Bayreuth may have featured), such that 56% of the cycle’s attendees were from interstate and overseas. And the great Jeffrey Tate was secured to conduct, a man opera stars might follow. Tate was disinclined to leave preparation to assistants, and hence he was there to instruct, encourage and inspire from day one. Director Pierre Strosser was intimately acquainted with the production and convinced the cast to give less, not more, to artistic advantage. Dr Bassett reported on the numbers for 1998: $7.9 m production costs were defrayed by $2.8 m from the SA government, a modest .25 m from the Commonwealth, $4.2 m at the box office and the balance from private sponsors and donations, with an estimated benefit to the State of $10 m. Contemporary footage showed how Adelaide glowed with Rheingold during this cycle, and we saw among the enthusiastic audience luminaries such as Eva Wagner, Jeffrey Smart and Marilyn Richardson. The stars aligned for the 1998 Ring, which, as Peter showed, did not fully occur later on. But first, an interlude: the 2001 Parsifal, from a 1993 production, the first staging ever in Australia, at a cost of $2.3 m ending roughly at par, despite opening days after 911 and the collapse of Ansett Airlines, in the shadow of budget constraints and sponsored by a government then set to fall. Peter showed us a tiny bit of footage from the production – with some 30% of the gate from overseas and interstate, it seems a great shame that it could not be reprised, in tandem with the 2004 Ring for example, to swell receipts with a relatively manageable additional outlay. But by then, the climate had changed. And so to 2003/04 and the Elke Neidhardt production of the Ring, in which, à la Deryck Cooke, we saw the world end magnificently. The 2004 Adelaide Ring was thrilling and inspired but actually came perilously close to folding before it opened, due to a number of factors. One thing in its favour was the ability of the outgoing Liberal administration to squeeze $4.3m out of the Commonwealth (before the Australia Council took over federal funding completely): the box office yielded $5.7 m and the balance, after some private funding, came from a fairly reluctant State Government ($2.5 m). Almost 70% of the audiences came from overseas and interstate. (i) The immense cost of a wholly new production. The numbers bounced around in the planning stages, ranging from $9.3 m to $15.345 m, eventually officially costing-out at $15.143 m. The sets, costumes and effects machinery had to be built, tested and calibrated from scratch, and fitted together from disparate sources, involving design and production people in 5 different states, with 28 model-makers producing detailed miniatures of sets at a cost of $250,000, the creation of Fafner’s gigantic, industrial-quality claw ($237,000), and Brünnhilde ‘s protective wall of fire, an effect that pumped-out more heat than Sydney’s Olympic flame – but within a building! (ii) Management and Production structure. Unlike 1998, there were no key players in key roles – no Artistic Director or Production Manager, and formal agreements were not put in place with necessary participants. For example, it was simply assumed that the Festival Trust would come to the rescue in set design-and-build; then it announced it was too heavily committed to its existing programme, so expensive outsourcing ensued (see (i) above). As Peter summed-up in pithy fashion, too few had to contend with too much. (iii) A chary government. The Rann administration was in its infancy, and a minority government at that. Understandably perhaps, they saw the need to inject massive funds into an audacious and risky venture, that smacked of elitism, as something of a “baguette de merde.” Eventually, to its credit, it committed to the Ring, but probably did so because the price of aborting may have been greater. This factor was largely to blame for the snuffing-out of any revival of Neidhardt’s great conception. As Peter demonstrated, attempts to keep the fire burning were extinguished by the sheer magnitude of the production. Its sets were too massive to take on the road, or export. The budgetary blow-out scared-off the SA government. And whilst it at last worked-out that re-staging a successful original could be profitable, events had overtaken such a venture – the GFC, the departure of key players, and the announcement of the Opera Australia production in Melbourne (that fine city was obviously not content with taking the Grand Prix from us). It is a shame, but when viewing some of the footage concerning the 1998 and 2004 Rings and considering to its superb conductors, casts and crews, one could only join Dr Bassett in the hope that their memory might be kept alive, and marked in some apposite way. All in all, this was a fascinating insight to the hurdles faced by any organisation brave enough to mount the Ring, a vivid and factual account of Adelaide’s own ascent, a chance to re-visit the great productions, and a stark reminder that anything touching and concerning Wagner will always involve a degree of difficulty. Must admit, I'd always thought the Adelaide Ring wasn't repeated because Kevin Rudd was too busy pretending to be a fiscal conservative.